I nearly vomited in my mouth. 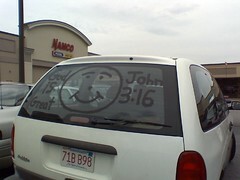 We have a Jesus van that goes all over town. The owner also jogs up and down the main road all the time holding up a Jesus sign. I always wave at him when he’s jogging because he works so hard, plus I figure that has to give me some good karma. Yeah no reason to be mean, that won’t stop me from laughing when they aren’t around. Thank God there are people out there selling God’s wisdom to us. Er, I mean thank John.